Tá an-athas orm go bhfuil sean-chara liom, Jimmy Deenihan, ceaptha ina Aire ar an Ealaíon, an Oidhreacht agus ar Ghnóthaí Gaeltachta. Fear stuama é Jimmy ar chuir mé aithne air le linn dom bheith im thuairisceoir i gCiarraí Thuaidh beagnach scór bliain ó shin. Tá sé súntasach freisin go mbeidh an Ghaeltacht ag Bórd na Comhaireachta. Ní mar sin a cheapfá agus sinn ag léamh na luaidreán aréir. Ní fios an raibh athrú poirt ann – cheapfá go gcaithfidh gur amhlaidh a thit amach ón méid a bhí le rá ag Ronán Ó Domhnaill ar Nuacht TG4 – nó arbh é seo an plean i rith an ama. Pé rud é, tá fear nua I nDún Aimhirgin. Gach rath air! Foilsiú: 09/03/2011 . igaeilge a d’fhoilsigh. Ranganna: An Ghaeilge, Cultúr, Nuacht. 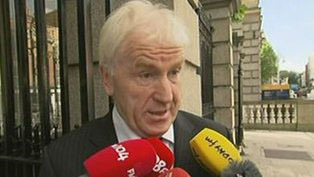 Clibeanna: Fine Gael, Jimmy Deenihan, Rialtas. Tá clár toghcháin FG á sheoladh ar maidin agus de réir an méid atá feicthe agam – agus cloiste agam – tá moltaí spéisiúla ann i leith na Gaeilge. Is iad seo na moltaí i leith múineadh na Gaeilge, an gad is giorra den scornach faoi láthair. Oideachas: Tacaíonn Fine Gael le forbairt leanúnach na nGaelscoileanna agus aithníonn sé an ról suntasach atá ag gluaiseacht na nGaelscoileanna in athbheochaint na Gaeilge taobh istigh agus taobh amuigh dena ceantracha Gaeltachta. Chomh maith le sin, oibreoimid lena Coláistí Samhraidh chun níos mó scoláirí a mhealladh go dtí an Ghaeltacht. Táimid meáite ar athchóiriú a dhéanamh ar an mbealach ina múintear an Ghaeilge sa chóras bunoideachais agus sa chóras iarbhunoideachais, chun féachaint chuige go bhfuil múinteoirí in inmhe grá don teanga a spreagadh sna scoláirí go léir agus go bhfuil an curacalam leagtha amach ar bhealach a ghríosóidh na scoláirí chun an teanga a labhairt tar éis dóibh an scoil a fhágáil. Creidimid má dhéanaimid athchóiriú ar an mbealach ina múinimid an Ghaeilge go spreagfar níos mó scoláirí chun staidéar a dhéanamh ar an teanga agus chun í a úsáid taobh amuigh den chóras oideachais. Creidimid nár chothaigh an Ghaeilge éigeantach fás na teanga nó grá don teanga. Déanfaimid athchóiriú ar an gcuracalam dara leibhéal agus scrúdóimid go criticiúil an tionchar atá ag na modhanna oiliúna do mhúinteoirí atá i bhfeidhm i láthair na huaire. Ní bheidh an Ghaeilge mar ábhar roghnach go dtí go mbeidh cainteanna ar an dá ábhar tugtha i gcrích. Bronnfaimid 50% dena marcanna ar an mbéaltriail. Déanfar iniúchadh ar churacalam dúbailte go dtí an Ardteist, ceann amháin ar an gcóras reatha agus ceann eile ar an nGaeilge chumarsáideach. Déanfar iniúchadh ar phoinntí breise sa chóras iontrála go coláistí tríú leibhéal. Déanfaidh Fine Gael lion na ndaltaí atá ag gabháil don chúrsa Ardteiste Ard leibhéal a mhéadú faoi dhó faoin mbliain 2018. 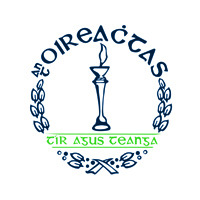 Dar le Michael Creed, TD Fhine Gael i gCorcaigh Thiar Thuaidh, an Dáilcheantar ina bhfuil Gaeltacht Mhúscraí, ciallaíonn moltaí FG nach mbeidh deireadh le Gaeilge mar ábhar riachtanach don Ard Teist go dtí go mbeidh sí ina rogha nádúrtha ag daltaí meánscoile. Dar léis nach dtarlóidh seo go ceann glúin nó dhó. An cheist atá agamsa: ceist dúinn féin mar phobal Ghaeilge/Ghaeltachta agus do Fhine Gael freisin: an fearrde an Ghaeilge más amhlaidh go dtarlaíonn seo go luath nó go brách? Ghaeilge agus don Ghaeltacht, dar liom, Scála Líofachta Náisiúnta. Scála Líofachta Náisiúnta: Déanfaimid iniúchadh ar fhorbairt scála líofachta náisiúnta don Ghaeilge. Chuirfeadh an scála deich gcéim seo ar cumas gach saoránaigh measúnú d’fháil ar a chumas agus úsáid a bhaint as modhanna nua-aimseartha múinteoireachta agus as an nua-theicneolaíocht chun feabhas de réir a chéile a chur ar a líofacht de réir mar a oireann dó féin. Sin smaoineamh nua – creidim – agus is fiú é a fhiosrú agus a chur i bhfeidhm. Is fiú a lua freisin go bhfuil geallúint sa chlár toghcháin i leith Acht na dTeangacha Oifigiúla agus fáiltim roimis. Acht um Teangacha Oifigiúla: Déanfaidh Fine Gael athbhreithniú ar na dualgaisí faoin Acht um Teangacha Oifigiúla chun a chinntiú go bhfuil an caiteachas ar an teanga dírithe ar fhorbairt na teanga ar an mbealach ia éifeachtaí. Ní féidir a shamhlú aon bhealach go bhfuil an chaiteachas a eascraíonn as an reachtaíocht seo eifeachtach – go h-áirithe an t-airgead a chaitear ar Oifig an Choimisnéara Teanga – agus nach aon chabhair é le forbairt na teanga. B’fhearr i bhfad an €1m (nó mar sin ó bhuiséad an Choimisinéara) a chaitheamh ar leabhair do dhéagóirí nó Pléaracá Chonamara a leathnú go Gaeltachtaí eile…. Tá’s agam go bhfuil daoine ann a deir nach gcaithfear airgead a shábháilfí ó chiorruithe i leith Oifig an Choimisinéara mar seo – ach caithfear an argóínt a dhéanamh agus tá sé súntasach go bhfuil an argóínt á dhéanamh sna téarmaí sin ag FG. Foilsiú: 15/02/2011 . igaeilge a d’fhoilsigh. Ranganna: An Ghaeilge, Cúrsaí Reatha, Nuacht. Clibeanna: Acht na dTeangacha Oifigiúla, An Ghaeilge mar chroí ábhar don Ard Teist, Enda Kenny, Fine Gael, Maorláthas Ar Mire, Michael Creed. Dearcadh éagsúil i leith na ceiste faoi mholadh Enda Kenny deireadh a chur le Ghaeilge mar chroí-abhar san Ard Teist – is iad na ceisteanna seo faoi ‘poxy survey’, ‘gravy train’ agus ‘wretched summer schools’ agus ‘making children miserable’ a chaithfimíd aghaidh a thabhairt orthu, fiú is go léiríonn teanga an cholúnaí a fuacht(nó fuath don teanga). An mórcheist: Cén fath nach mbionn níos mó daoine líofa sa Ghaeilge fiú is go mbionn 5 uair in aghaidh na seachtaine ar feadh 13 bl caite acu ag foghlaim na Gaeilge? Tá fadhbanna ag abhair eile freisin – mata, béarla. Tá deacracht níos doimhne sa chóras oideachais (nó scruduithe), creidim. Foilsiú: 14/02/2011 . igaeilge a d’fhoilsigh. Ranganna: An Ghaeilge, Cúrsaí Reatha, Míreanna Mire, Nuacht. 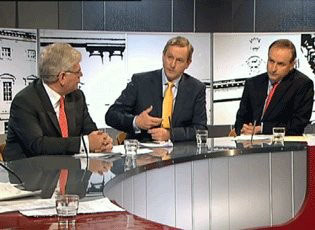 Clibeanna: An Ghaeilge mar chroí ábhar don Ard Teist, Enda Kenny, Fine Gael.